Each of the apostles is distinguished by a different beard, haircut and gesture. Their identity is revealed by their names on the books that they carry. This relief comes from the cathedral of Saint Peter in Vich. It formed part of a frieze on the west front, the ceremonial entrance to the building. 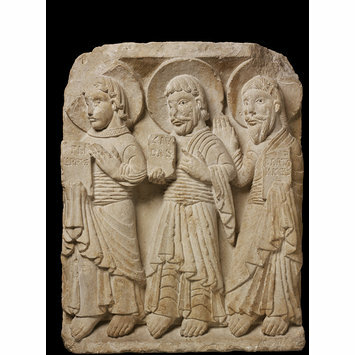 Three Apostles carved in limestone. Inscriptions on the books they carry identify the Apostles . Each figure shares the same stocky proportions, oversized hands, bare feet and almond eyes with lead-filled pupils and large halos. The Apostles are individualised by differences in hair, beards, and gestures and especially by variations in their crisply pleated garments. Set in a shallow space in three-quarter poses, the apostles on this relief and the related relief in Kansas City, move right to left in opposition to their companion prophets on a Lyons relief now in Lyons, who move from left to right. Bought from Durlacher in London, 1932. Previously in the Iglesia de la Guía, outside Vich in North East Spain where it had been preserved following the destruction of its original location - the Cathedral of St Peter in Vic. 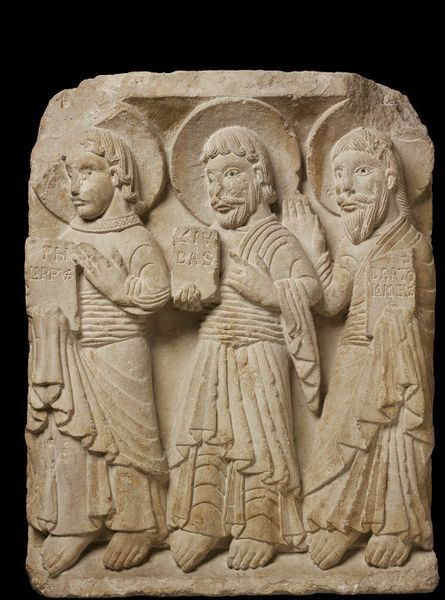 The relief, with another carved with the figures of Saint Paul, Saint Andrew and Saint James , now in the Nelson Gallery and Atkins Museum , Kansas City, and a third relief with three figures of prophets, now in the Municipal Museum at Lyon, formed part of the decoration of the west front of the Cathedral of Saint Peter in Vich about forty miles from Barcelona, which was destroyed in 1791 to make way for a neo-classical building. Other important fragments of sculpture were discovered during excavations in 1940 by Dr Eduardo Junyent and these are now in the in the patio of the Episcopal Museum at Vich, together with other pieces formerly in the Lapidary Museum. Historical significance: Inscriptions on the books they carry identify the Apostles . Each figure shares the same stocky proportions, oversized hands, bare feet and almond eyes with lead-filled pupils, and large halos, the Apostles are individualised by differences in hair, beards, and gestures and especially by variations in their crisply pleated garments. Set in a shallow space in three-quarter poses, the apostles on this relief and that in Kansas City, move right to left in opposition to their companion prophets on the Lyons relief , who move from left to right. The scheme of decoration at Vich was a representation of the College of Apostles distributed on either side of Christ enthroned surrounded by angels and symbols of the evangelists. Twelve prophets were also included in the scheme. Narrative panels, the subjects of which are still to be satisfactorily explained, must have been set in horizontal friezes on either side of the portal, which probably resembled that still in existence at Santa Maria de Ripoll in Gerona. The College of Apostles refers to The Twelve Apostles as the body of men commissioned by Christ to spread the kingdom of God over the whole world and to give it the stability of a well-ordered society: to be the founders, the foundation, and pillars of the visible Church on earth. The name "apostle" connotes their commission. Williamson. P Catalogue of Romanesque Sculpture (V&A,1983) pp 102-103 cat no. 49. Stokstad, M. 'Romanesque Sculpture in American Collections XV, Kansas CIty, Missouri and Lawrence, Kansas'. Gesta. XVI. 1. 1977. p.52. Stokstad, M. 'Three Apostles from Vich', The Nelson Gallery and Atkins Museum Bulletin. Vol. IV. No.11. August 1970. pp.2-24. Monreal y Tejada, L. La Cahedral de Vich. Barcelona. 1942. p.56. pl.x. Barral y Albet, X. La Catedral Romànica de Vic. Barcelona. 1979. p.124, fig. 74. Salrini, R. Medieval Sculpture London. 1969. pl.83, and p.321. Williamson, Paul ed. European Sculpture at the Victoria and Albert Museum. London. 1996. p.44. Gros, M.S. 'L'antie retaule romànie de la Catedral de Vic: assaig de reconstrucció' Studia Vicensia. I. 1989. pp.99-126. Stokstad, M in Cahr, W. ed. 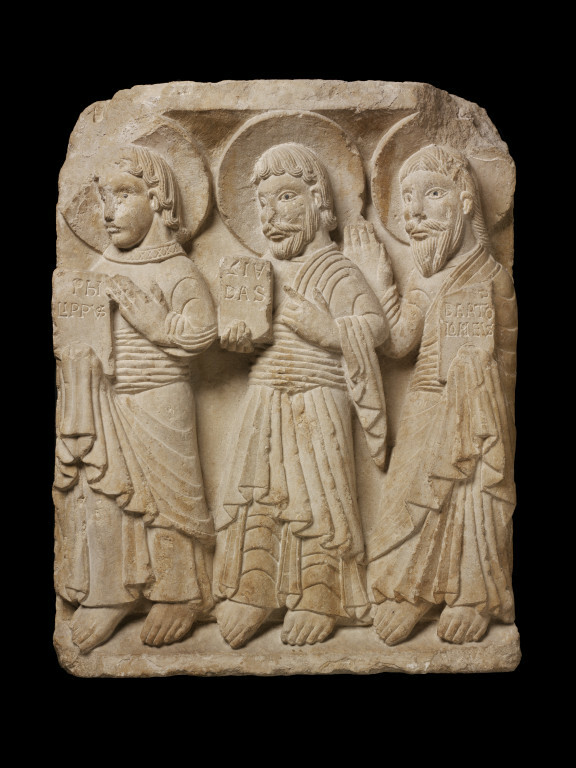 Romanesque Sculpture in American Collections. II. Turnbnt. 1999. pp.222-23.